thecontemplativecat: Who Is in Charge? Who's in charge here? I have heard that question in so many voices, situations. Sometimes I am in charge, good or bad. I gladly ceded that responsibility now that I am retired. For twenty years and six-hundred students, I was in charge. Parents, we were/are in charge. For feeding, clothing, and all sorts responsibilities for our children, we were/are in charge. Paying bills, having the oil changed, finding lost items, etc.--we adults: we're in charge. Given all that, some of the most amazing I'm in charge here people are children. They have no power, no reason to believe that they are in charge. Even though you and I know that a child should not be in charge in critical areas, they are in the sweetest and most amazing ways. Who in charge here? Both. There are many elements in all lives when exasperation leads to a real question: Who is in charge of me? I love it when children speak their minds. Their reasoning can be astonishing. They process and speak without having all the confusion floating around in our adult brains. When my oldest son was three, his dad was out looking at some land we were planning to buy as an investment. In the car, he asked where hid dad was. "He's out looking at your land." After a brief pause, my son said, "But I can't even drive or cook yet!" I guess he thought we were sending him out on his own. Oh, sweet little guy! He certainly expressed himself well. Cute kids, and I like the quote "God is large and in charge." It says everything, doesn't it. I love the last one, that's so sweet and the puddle walker reminds me of days gone by when I would dress my kids in their rain gear and send them out to jump in puddles. Jumping in puddle is a fond memory. I used to be in charge but not these days! We are not. either. Oh, well. Amen! God is ultimately in charge. May His Spirit live through us so that He is truly in charge of all we say and do. Loved the child in the puddle--and that dog is really trained well. I remember as a kid not being allowed to do that or to walk in the rain. I use to pout and think, wait till I am grown up. All grown up now and still don't do it. Think my Mom still in charge? I think it is probably common sense. But Mom's voice still rings in my brain. The puddle was my favorite until the last one. LOVE IT! what a talented, sweet girl and apparently a loving dad. This is wonderful, 'tis good to know just WHO is in charge. I love it for just a short time, the grands are incharge, even though suborintate to Him, but he allowed us to have them for a short time as the 'mini' people who were in charge of our lives. I will never forget a retirement seminar I attended. when the speaker said, today you are in charge. You say jump, they do. tomorrow you will be just one of the crowd, remember that and enjoy the care free feeling that now someone else has that RESPONSIBILITY. The retirement speaker said that very well. The boy, the dog and the puddle was my favorite. That one makes me smile every time I see it. Dog was so patient. Might have been that a parent is there filming? But I like to think the boy had some authority. I always thought that I wasn't worthy, not to waste His time on me. But then it became clear that He had more time than we can imagine, and that He is larger than I could imagine. Amen! Just the same, years ago my boss asked, who was the 'alpha' - my little dog or me? Reluctantly, I had to admit it was probably my dog. All these videos were great, but the last one instinctively prompted me to clap! That little girl is so precious and she has such a loving dad. Kids can sure just have fun and let their thoughts flow. Don't think I'm in charge of much these days. Because we are not in charge, knowing that God is gives us all strength. If looks could kill, that cat would have all of us dead. Oh yes. that is why I grabbed that photo. Children never cease to surprise and amaze us in so many ways. A child's insight is so unselfish. The eternal question: Who is in charge? God is, if only everyone realized that. We all think we are in charge but of course God is really. That is the essential message everyone should know. Mud puddles are like magnets for little kids, aren't they? I stomped in my share. Children are so great and in charge of love for sure. God bless children … they never cease to surprise and amaze me. The good thing is that at my house, I'm always in charge. Although Lizzie tries to be! But she doesn't have thumbs! Just imagine if they did have opposable thumbs! Our cat hops up on the window ledge and I don't know who's got who trained more but Gingers growling can be heard through the glass. Its like hes saying "feed me now and I don't want to debate it" not that he could. Or that anyone could debate it with him. ---No doubt about it...God is always in charge. But I admit that at certain times, he's loving enough to let us "hold the wheel". Other than that, our CATS have us trained rather well...lol. He does let us drive,and He is to remind us that He is there. I'm in charge. At least that's what I tell hubby. And it's about time he learned, too. 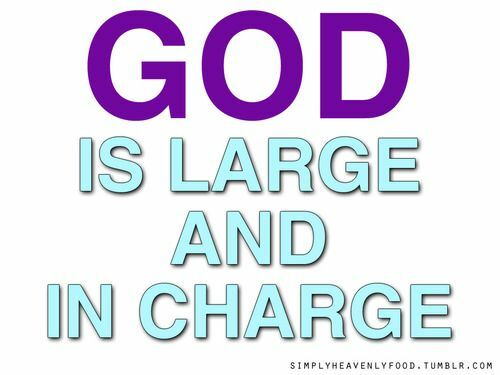 Yes for me either GOD is incharge!